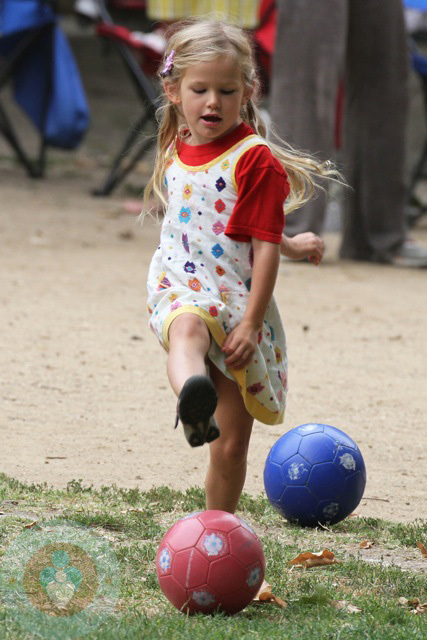 Home » Violet Affleck Shows Off Her Soccer Skills! Violet Affleck showed off her soccer skills while being cheered on by her mom and sister yesterday. Not wanting to sacrific style for sport, Violet wore a patterned sundress dress accompanied by a pair of sneakers. Seraphina kept busy by playing inside a playhouse and navigating through the jungle gym. Jen and Ben Cheer Violet On!